Upcoming Intel and AMD processors, first looks. Intel just issued a press-release yesterday that covered the re-opening of their high-volume semiconductor manufacturing facility in Chandler, Arizona, converting it to a leading-edge 300-mm, 65-nm process factory. Obviously this new factory will be producing the new 65-nm Pentium 4 processors that go by the codename 'Cedar Mill' and will be introduced in 2006. Cedar Mill Pentium 4s will be introduced in the 600-series of Intel Pentium 4 processors and hence will feature 2MB of L2-cache memory. These same processor cores will also end up in Intel's dual core processors much like todays Pentium Ds are basically two Prescott cores on a single substrate. Future Pentium D processors, codenamed 'Presler' will simply have two Cedar Mill cores which are also physically separated, unlike current Smithfield Pentium Ds. 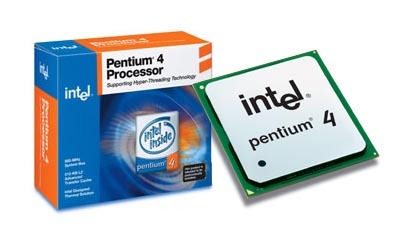 Intel's Pentium 4 processor which was first introduced in 2000. With the new Presler Pentium Ds Intel will introduce new model numbers as the Preslers will be dubbed the 900-series. And of course there'll be a series of Extreme Edition processors based on Presler. The new XEs will have support for HyperThreading and 1066MHz front side bus unlike the 900-series, effectively making them the fastest processors Intel has to offer. Unfortunately all of these processors and the NetBurst architecture that was introduced in 2000 will be superseded by a new architecture that Intel will launch in late 2006. This new architecture will feature all of the good bits of both the Pentium 4 and Pentium M architecture such as the 64-bit extensions, fast front side bus, optimized power consumption and dual core support. The details are a bit sketchy still, but Intel seems dead set on keeping power consumption down to about 35-watts for mobile processors, 65-watts for desktop and 80-watts for server processors. That's a far cry from the up to 130-watts of power consumption some of Intel's current single-core processors are capable of. Mobile processors will go by the Merom codename, whereas desktop processors are said to carry the Conroe codename, no details yet on server processors though. 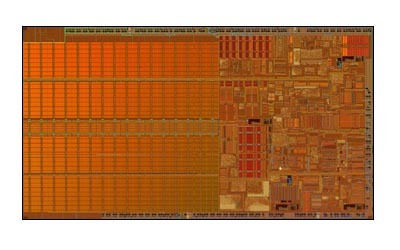 A die-shot of Intel's Dothan 90-nm Pentium M processor. But before Merom debuts Intel will introduce their third generation Centrino mobile technology which will feature the dual-core Yonah processor. Just like Cedar-Mill and Presler Yonah will be a 65-nm processor but will feature something called 'SmartCache' by Sean Malony, Intel's executive vice president. In essence SmartCache is cache memory that's shared among the two processor cores and means a reduction in die-size and hence a reduction in manufacturing costs. According to Intel we'll also see a single-core Yonah to tailor to the entry-level notebook market, which could well be the new Celeron M.
Discuss This Article (25 Comments) - If you have any questions, comments or suggestions about the article and/or its contents please leave your comments here and we'll do our best to address any concerns.